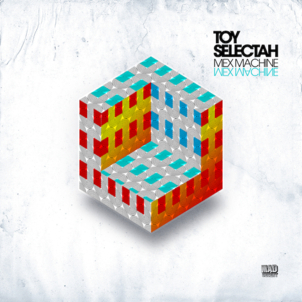 Toys Selectah’s first EP on Mad Decent dropped today, aptly titled Mex Machine. Toy Selectah – Half Colombian Half Mexican Bandit from Mad Decent on Vimeo. Toy Selectah is not only kind of a don for digital cumbia/nuevo-futuristic south american bass sounds, he can also be called a staple of Global Bass music for a while now, as well as his features Isa GT on “No Pasma” and Mumdance on “Ani Riddim”. “Sonidero Compay” lets reggaeton king DJ Blass flow over a proper cumbia beat, while the remix from Sheeqo Beat, 3Ball MTY member and (like his whole crew) well deserved protégé of Toy Selectah, turns the whole thing into an uptempo Tribal Guarachero sound. “La Ravertona” keeps up with the pace somewhere around 150 bpm, a fidgety, neon-colored Rave trip into Cumbia land. Every track is soaked in Toy Selectah’s history and musical knowledge (which means having worked as a producer and remixer for names like Calle 13, Buraka Som Sistema, Vampire Weekend, Morrisey or Manu Chao, having been also one of the most influential minds in making Reggaeton a global affair as A&R for Universal’s Machete Music sublabel and having founded the 9 times platinum decorated Hip Hop group Control Machete). Say hello to the first proper release of one of the undeniably most influential, creative and exciting artists in the South American Global Bass scene.